We can help you design and implement the patio of your choice. Patios are not just a paved area only to be used in the summer, but are more of an extension to the living area of your home, a perfect place to relax, perhaps for sunbathing, barbecues or a safe and level childs play area. We can offer you an almost endless choice of colours, textures and materials which make the design possibilities almost endless. Patios are an ideal area for socialising and relaxing. 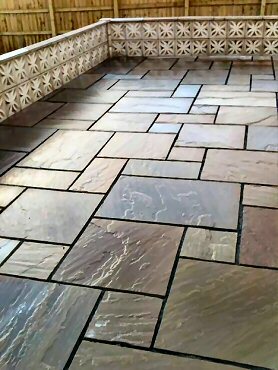 Creating the right effect on your patio is important to us. We listen to your ideas and can cater for traditional, modern and contempary designs and materials, while taking into consideration any drainage needed and any walling needs. We can source the highest quality block paving or paving stones from the best manufacturers, either Marshalls, Belmont, or Thomas Armstrong at Consett. Our patios will provide years of durable service, typically paved with larger slabs, block paved or cobbled patios are also very popular and a decorative edging helps add the finishing touch. Alexander Driveways are experienced providers and installers of block paving and flagstone patios Durham, County Durham, Chester-le-Street and surrounding areas.